Nobody bridges the gap between generations or musical genres like SWEET PLANTAIN, a refreshingly new string quartet. 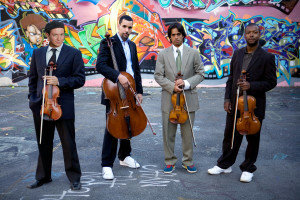 Artfully fusing the western classical traditions in which they were trained with the hip-hop, jazz improv, and Latin rhythms on which they were raised, their original writing and live shows educate and entertain. Separately hailing from the South Bronx, New Jersey and Venezuela, together these musicians give voice to a sound that is contemporary, multicultural and very New York.